Defying the Myth that Gouldians are FRAGILE! Defying the Myth that Gouldians are NOT GOOD PARENTS! Defying the Myth that Gouldians NEED CONTROLLED TEMPERATURES! Defying the Myth that Gouldians will eventually BECOME BALD! You will be Defying these Myths too! 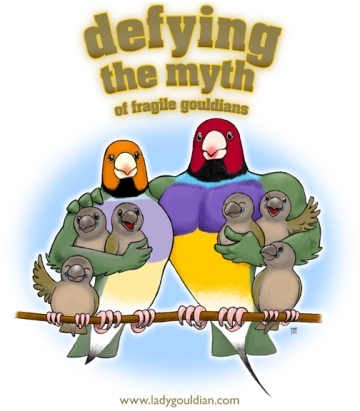 I invite you to join me in celebration of the Lady Gouldian Finch! It is my sincere hope that this website will provide you with information that will enable you to more fully understand one of Nature’s most beautiful creations. While some of the information that you will read here may already be familiar to you, I hope that you will find the new research being done with the Gouldian Finch will offer you new insights in keeping them strong, healthy and vibrant in your home and aviary. As I continue to add new articles, I would appreciate your input. If you have a soft-food recipe that has worked for you, please let me know. Once the new Diet article is complete, I would like to be able to add your recipe so that others can try it! No one thing works for everyone, so we need to experiment with different methods while working toward that common goal of vitally strong, healthy Lady Gouldians! The Photo Trouble Shooting Guide is here to help you recognize the problems that others have faced and correct the problems by yourself, if possible. When a diagnosis is not possible by viewing a photograph alone, I will direct you to consult with your local avian veterinarian for help. I will be adding more photos to this Guide as they are submitted to me so that we can all share this valuable tool. I have added a NEW Gouldian Genetics Forecaster that was designed by Carlos Matos. This is free to anyone. All you need to do is download it from the provided link. You no longer need your own unique serial #. At www.birdhealth.com.au you will also be able to enter Dr. Rob Marshall’s CLIENTS ONLY section of his website where you can read about his work with Gouldian Finches in the wild, as well as read his just released, on-line version of Gouldian & Finch HEALTH. This section of Dr. Marshall’s website also contains a companion on-line book to his recently released The Budgerigar. And sign up with your own selected login and password. If there is anything that you find missing from my website, that you would like to see in the future, please do not hesitate e-mailing me. It is your input that will allow me to provide everyone with the information that they need to keep their birds healthy and strong.